This weather has been so wacky! Although this winter has been pretty mild so far, the DC area has had its share of frigid air as well. The constant shift in temperatures has thrown me off my winter hair regimen. 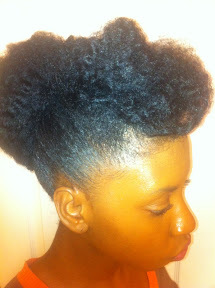 I typically switch over to heavier cream/oil based products and increase my protective styling. This year...I'm slacking. I'm gonna get my life together, I promise. I've just returned to my holy grail winter moisturizer. 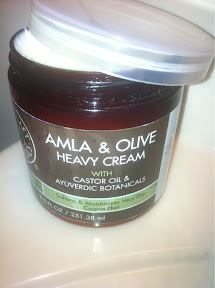 Qhemet Biologic's "Amla and Olive Oil Heavy Cream." My hair stays moist with this product. 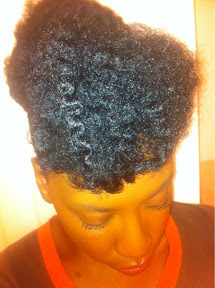 It also provides great shine and just enough definition for a decent twist out. Here are a description of the product on Qhemet's website: "Our ultra thick cream contains Amla, Brahmi and African Aloe, premium Afro-Indian botanicals used for thousands of years to nourish the scalp and strengthen and condition hair. MSM sulfur nurtures follicles and encourages healthy hair growth, Mediterranean Olive Oil delivers emollience and lubricity while Vegetable Glycerin and pure African Castor Oil lends sheen, softness and intense moisture." I let my hair loose as soon as I finished this post. I just love big hair!! 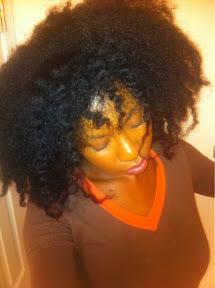 But I'll commit to protective styling at least 4 days out of the week to retain length.